A number of us completed a pattern making class earlier in the summer where we learned to make a skirt, trousers and dress block. Basically a standard pattern made to fit our own bodies. I met our teacher Tiina at our open day back in April, she was telling me all about her career as a pattern designer, that she was living locally and an idea began to form. We made arrangements, found a room big enough for us to spread out and off we went. 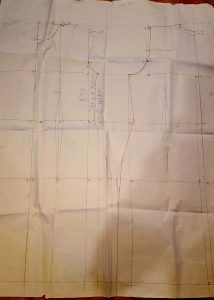 So first up we made a skirt block, – straightforward enough with just a few basic measurements and a bit of plotting and maths to get the front and backs drafted with darts. She then showed us how to manipulate the darts and how we could slice up the block to make different styles of skirts – flared, pencil, with waistbands, yokes etc. We went home the first night and our homework was to make a muslin or toile of the skirt. That was fine and we tried them on the second night and Tiina made whatever adjustments were needed. We then started on our trousers block. Again with the minimum number of measurements, we drafted the block and went home to do a muslin. Third and fourth classes were spent making the dress and sleeve blocks and making muslin and sorting out the fitting. We went home after the 4 classes with blocks adjusted to fit us perfectly and it was up to us to make use of them. I had great plans to spend the summer months practising on these as I had so many ideas in my head. But theusual stuff got in the way and I didn’t get to look at my blocks until the last few weeks. 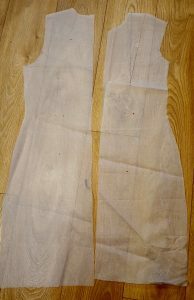 I started by tracing the pattern pieces above onto pattern paper and started slashing and moving darts around, adding pleats to the skirt, making pockets, short sleeves and keeping the fitted bodice. Basically an easy to wear, comfortable and flattering dress. I realised I had to raise the waist to what would be my natural waistline and scoop out the neckline a bit (red permanent marker on muslin). I just made the changes to the paper pattern and decided to cut out the dress in the final fabric and go for it. I used this linen fabric from the website and regular black lining. I’m so happy with this dress, it’s such a treat to just pull out a few pattern pieces and make something that doesn’t need 10 fitting adjustments before you can even cut out of your fabric. 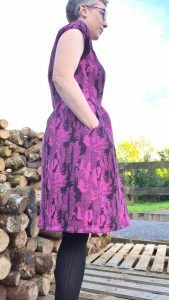 I think I will try another version of this dress shortly with long sleeves in a ponte knit for winter. Of course I ran out and bought some books then just to put more pressure on myself!! The measurements used in these books are different to Tiinas but it will give me an opportunity to practise on a few different blocks. I have since started working on an easy fit dress block, I got as far as the sleeve and stalled. 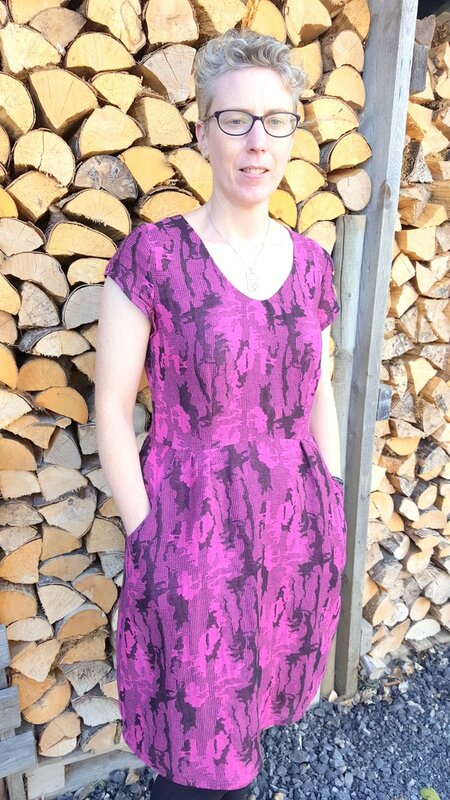 I’m following on Bloglovin’ Maeve and the pink camouflage caught my eye as soon as a flicked over it. I had always thought “ugh, camo” when I saw it on the site but look how amazing it is!! 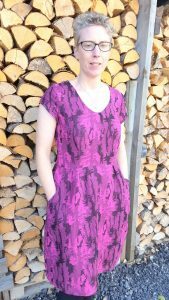 I downloaded a “Jersey T and Dress” sloper from Burda recently and thought it was great. Thinking of doing the same with the bodice as I have 13 month old twins and unless classes are in home town I couldn’t attend. Great work! 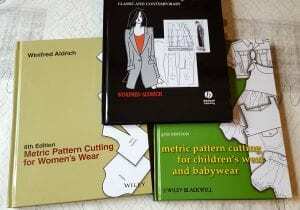 I envy you the groundwork you have done to make all future patterns easier. Now all I have to do is look at that pink camo. Lol. 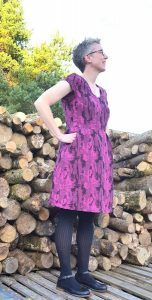 Keep working on your sloper – I had looked at them lots of times before but never took the plunge. Its possible to figure it out yourself with a bit of perseverance. Fair play on getting any sewing done with young twins – I’d be too exhausted! !